Today, we will see how to get the GOS toolbar in the custom Report. 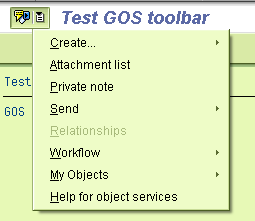 GOS toolbar works on the Business Object. To be able get GOS toolbar, we need to have a Business Object and Business Object Key. For example, to get the GOS toolbar for the customer, we need Business object KNA1 and customer number as the key. So, if we want to have a GOS toolbar in our custom transaction than we need to have a key before generating that. This is the reason; we don’t have the GOS toolbar option in the standard SAP Create transactions like: XD01, VA01, MM01 and so on. This test program will provide us the GOS toolbar for the Customer in our custom program (Z program). This will provide us all the functionality of the GOS toolbar which are available in the XD02, XD03 transaction. WRITE: 'GOS test for Customer'. Do we need to any configuration along with this code (update tables). I am getting the GOS toolbar. But when I slect CREATE all the options are greyed out. For which business object, you are trying to get a GOS toolbar? We have Z object. It is a table. I don’t see that object in “Swo1″ but there is table with that z name. This is part of production support. Do i need to check any config table??? Can you please suggest not above issue? You must need a business object created in the SWO1 to be able to store the documents. If you see closely the above example, it uses the standard business object for the customer. Same way, you need to have the business object for your requirement. Service for object functionality is grayed out for the dispute management. I am not able to add documents to the cases. Not sure how can i turn it on. Service for object functionality is grayed out for the dispute management. I am not able to add documents to the cases.Can you provide the Transaction you are using? I am working on ECC 6 and have a problem with VA03 txn. GOS toolbar doesn't appear and when I am trying to get it through the menu there is message 'No services available'. In the meanwhile everything works correctly with ME23N for example. I see that you are good expert in this topic, may be you could help? Thank you in advance, Marina. Our 'create attachment' icon is greyed out in fbd3. It works fine for everything else. Any suggestions? We would like to grey out the create attachement option, as it stores to the SAP Db and we do not want the users to use that. We have already setup the 'store business document' that we want the users to use. How can we grey 'create attachment' out? Nice blog and appreciate your efforts in explaining from every corner. My requirement is to attach the GOS toolbar and its functions to a custom WD screen. Is there any SAP delivered component throuh which we could achive it? Instead of accessing through the CL_GOS* classes. please shootout any other thoughts if you see.. I want to restrict user to delete attachment file. SAP has a authority object S_GOS_ATT. You can use this to control the User’s authorization. Check this SAP Knowledge Base Article Authorization concept while modify/delete attachments from Attachment list of Services for Object (GOS) for more information. This object check is available as part of different Support Pack based on your system version. Check OSS Note: 1293080 for more info. Hi Naimesh, was a very good one, but I tried adding a doc to a notification number . when I open the IW53 , i am not able to see the added document. Please suggest what has to be done more.